Religion > Altogether Now: Evangelicals Are Converting to Catholicism! Altogether Now: Evangelicals Are Converting to Catholicism! 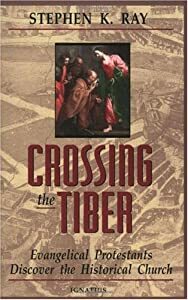 Now, I know I’m not the first to use the phrase “crossing the Tiber;” in fact, in my essay it was a reference to the book of same name by Stephen K. Ray, which details his conversion story. Truthfully, this, like any trend story is nearly impossible to prove using anything more than anecdotal evidence, though that kind of evidence is certainly readily available. More importantly, as both my piece as well as the recent story point out, those who do combine these traditions find the fusion to be an asset to their faiths. At the very least, we can be assured that each evangelical turned Catholic represents one less person claiming the Pope is the Anti-Christ.